Company A: At New Iberia with four 20-pdr Parrott rifles. Captain Eden H. Fisher resigned on November 20th. Captain Harvey B. Hall replaced him. Company B: Perhaps an administrative error, this battery is listed on the third line down, below Battery C. No return. The battery was posted to New Orleans at this time of the war. Captain James Grimsley was promoted to major on October 1. Lieutenant John W. Day accepted the captaincy. 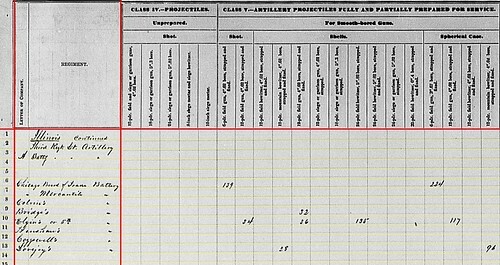 Company C: Listed out of order, on the second line, reporting at Baton Rouge, with four 8-inch siege howitzers . Captain Elihu E. Rose resigned on December 8, and was replaced by Lieutenant William Bough (promoted to captain, date of rank December 9). Company D: At Baton Rouge with five 24-pdr siege guns. Captain William S. Hinkle remained in command. Company E: Also at Baton Rouge, reporting four 20-pdr Parrotts. Captain James W. Hamrick in command. Company F: Another battery at Baton Rouge, but no cannon reported. Captain Francis W. Noblet commanded. Company G: At Baton Rouge and also reporting no cannon. Captain Edward McLaflin, of this battery, was the detachment commander at Baton Rouge and thus in charge of what amounted to a battalion-plus of artillery. However, Company G was split between the assignment at Baton Rouge and the New Orleans garrison. Company H: Reporting at New Iberia, Louisiana with two 30-pdr Parrotts. Captain James W. Connelly in command. 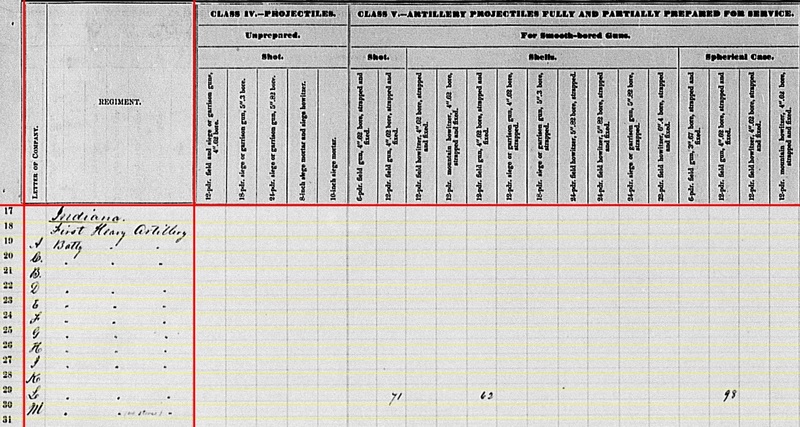 Company I: Garrison artillery at New Orleans, but reporting no cannon. Captain Richard Campbell’s command. Company K: No return. Also garrison artillery in New Orleans. Under Captain Clayton Cox. Company L: Reporting at Matagorda, Texas with three 12-pdr Napoleons and two 20-pdr Parrotts. Captain Isaac C. Hendricks commanded this battery, which was part of Major-General Cadwallader Washburn expedition sent to the Texas coast that fall. Company M: Only reporting stores on hand. Garrison artillery at New Orleans. This battery mustered in October. Captain Samuel A. Strong was in command. Remarkable photos depicting the company (heavy artillery being companies that is) in battery (top) and in march order (bottom). Parrott rifles, obviously. And while I had reservations about the size, these do appear to be 20-pdrs. So we might tentatively identify this as Company E. Though as we don’t have a specific date to work from this might also show Company A. Or perhaps one of the other companies borrowing equipment… or for full speculation perhaps one of the other companies with rifles assigned to the garrison (and thus escaped the summary lines). A wealth of details in the photographs, particularly for anyone studying drill and tactics. But the caption in the Photographic History points to another significant attribute for these photos. The clearest and most trustworthy evidence of an opponent’s strength is of course an actual photograph. Such evidence, in spite of the early stage of the art and the difficulty of “running in” chemical supplies on “orders to trade,” was supplied to the Confederate leaders in the Southwest by [Andrew D.] Lytle, the Baton Rouge photographer – really a member of the Confederate secret service. 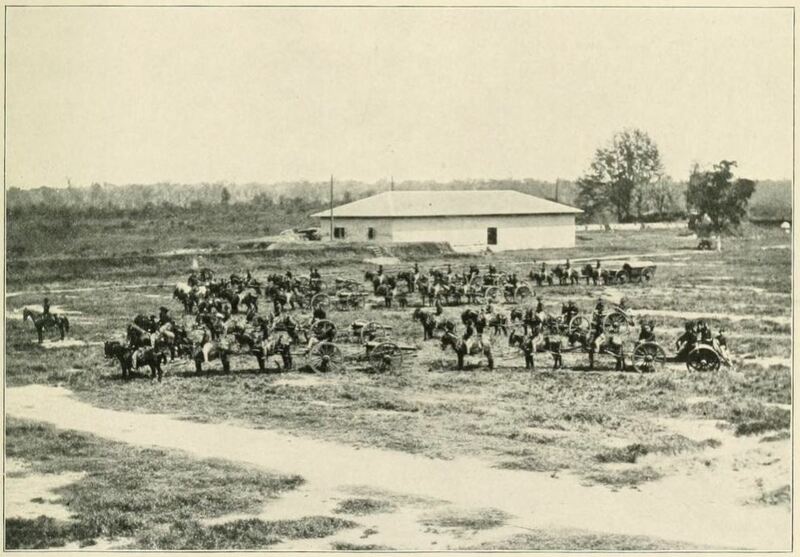 Here are photographs of the First Indiana Heavy Artillery (formerly the Twenty-first Indiana Infantry), showing its strength and position on the arsenal grounds at Baton Rouge. As the Twenty-first Indiana, the regiment had been at Baton Rouge during the first Federal occupation, and after the fall of Port Hudson it returned there for garrison duty. Little did its officers suspect that the quiet man photographing the batteries at drill was about to convey the “information” beyond their lines to their opponents. So those cannon we tally in the summaries? Reportedly the Confederates were also counting them… in the photographs. Not quite the microfilm drop of Cold War espionage, but still the use of imagery to gather intelligence. Company L: 71 shot, 62 shell, and 98 case for 12-pdr Napoleons. Company L: 48 canister for 12-pdr Napoleons. Nothing on the first page of rifled projectiles. So we move to the second and the Parrott projectiles. Company A: 9 shot, 357 shell, and 72 canister for 20-pdr Parrotts. Company E: 210 shell for 20-pdr Parrotts. Company L: 30 shot, 192 shell, and 34 canister for 20-pdr Parrotts. 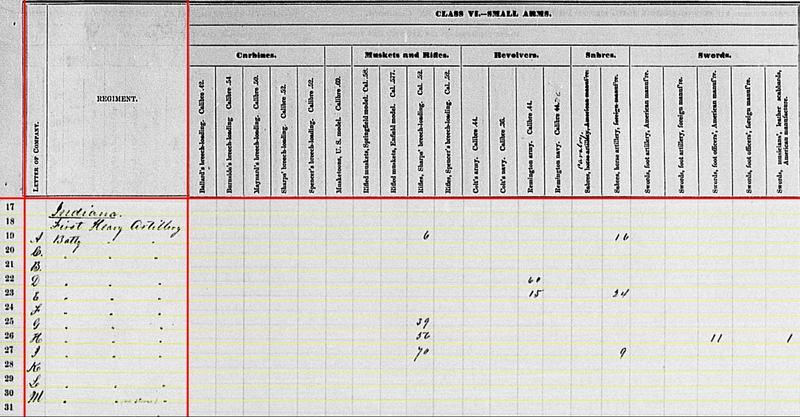 Company A: Six Sharps’ rifles and sixteen horse artillery sabers. Company D: Sixty Remington army revolvers. Company E: Fifteen Remington army revolvers and twenty-four horse artillery sabers. Company G: Thirty-nine Sharps’ rifles. Company H: Fifty-six Sharps’ rifles, eleven foot officer’s sword, and one musician’s sword. 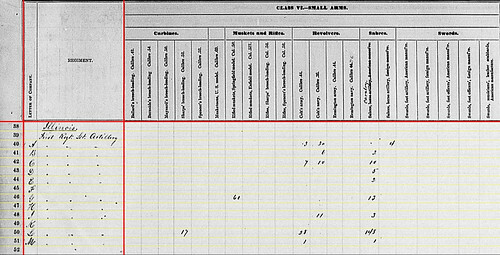 Company I: Seventy Sharps’ rifles and nine horse artillery sabers. Company A: 340 bags for 20-pdr Parrott. Company E: 339 bags for 20-pdr Parrott; and 3,000 Sharps’ cartridges. Company I: 4,300 Sharps’ cartridges. Company L: 226 bags for 20-pdr Parrott. Company E: 71 paper fuses and 295 friction primers. Company I: 5,750 percussion caps. Company L: 146 paper fuses, 6 pounds of musket powder, and 590 friction primers. That concludes the “Jackass” Regiment’s summary. I do believe this summary is lacking because certain equipment (particularly large cannon) were considered part of the garrison property, and not part of a regiment or company assignment. But the inclusion of the entire regiment in this quarter’s summary sheds light on how those heavy regiments served when indeed they served as artillery. In the onset of offensive movements, good positions should be selected for the heaviest pieces, from which they can maintain a strong fire on the enemy until the lighter pieces and the columns of attack are brought into action. These positions should be taken on the flanks of the ground occupied by the assailant, or on the centre, if more favorable to the end to be attained. Consider a generic scenario, what I call the “blackboard topography.” One might select good artillery positions on the flanks, or the center as Mahan proposes. But regardless it is the heavy, long-range guns that are chosen to open the attack. And we need to understand, tactically, why this is significant. Having the least mobile component of the army as the base from which the army can launch an assault makes good sense. More so having those long-reaching and hard-hitting guns opening the engagement at a range from which only the enemy’s peer heavy guns could respond. And at what range should those heavy guns open? Mahan did not delve into the technical details in this passage. For the most part, he left those things open as such was the domain of the artillerists and subject to change as the technology evolved. Though we can say given the pre-war context, I would offer 1200 yards. That was the effective range of a 24-pdr field howitzer firing shell. And that particular caliber and class would be the shortest-ranged of what was considered “heavy” artillery in the 1850s. Those heavy batteries are going to be magnets for the enemy’s attention. And that in mind, there appears an additional factor here beyond just the measure of range and weight of metal. Not only does the opening bombardment damage the enemy directly … “kinetically” as the modern military is fond of saying… but also by splitting the enemy’s attention in response. Again, “blackboard topography” here, but opening the engagement with those big guns ensures the enemy must respond and counter the bombardment… and thus redirects defensive firepower that would otherwise be applied to the infantry or cavalry. And in the study of assaults staged during the Civil War, we see this play out time and time again in the form of artillery duels. Most students will recognize the preparatory effects to damage the defense. However, consider how those duels usually played out. Particularly where ammunition supplies factored into how long the bombardment could be sustained. Do we know of instances where a defender deliberately ceased counter-battery fire in order to save guns and ammunition to repel the infantry? Yes we have. So this is not just were the defender pointed those cannon, but also if he decided to fire them or not. But what of the light artillery? This, readers, is about as close as Mahan comes to any notion of “artillery charges.” The notion here is to carry forward, with the assault force, an artillery component up to a point, while still out of musket range, where direct damage can be done to specific enemy positions. Since these light batteries at the time Mahan was writing would be armed with 6-pdr field guns and 12-pdr field howitzers, the idea range would be 1000 yards. Perhaps closing up to 700 yards if the commander wanted to push things. Closer than that and that safety clause comes into risk, as the enemy infantry might be able to close quicker than the battery could respond. I would stress the fire effects desired here. While none were articulated for the heavy batteries, the light batteries were there to do damage specifically to selected points of the defense. It was the light artillery that was to beat a path for the infantry and artillery. Consider also the control of these two elements of artillery. While the heavy artillery was far enough back to receive direction from the army commander (or at least the commander of the field), the light batteries were so far forward that only the assault force commander could exert any immediate control. Note also the emphasis placed upon keeping open maneuver space for the infantry or cavalry. Very important to ensure the attacking ranks arrived at the point of contact in an orderly formation. The maneuvers of these batteries should be made with promptitude; so that no time may be lost for the action of their fire. They should get rapidly over unfavorable ground to good positions for firing, and maintain those as long as possible; detaching, in such cases, a few pieces to accompany the columns of attack. In all the movements of the batteries, great care should be taken not to place them so that they shall in the least impede the operations of the other troops. This was the reason artillery batteries drilled hard on maneuver, being able to quickly place and unlimber. This point is lost sometimes on our battlefield walks, as we see the guns (if guns are indeed on the field to represent) sitting as if ready for action. I always stress this to any audience I’m leading on a battlefield tour. Maneuver of a battery was an intricate choreography. As for a section or battery accompanying the assault force right into the attack? Some will contend here’s that mythical “artillery charge.” No, not so. These cannon were reserved to go into action once the objective was attained. A hedge against an enemy counterattack. And we might say, while such was fine for the 1840s and 1850s, during the Civil War rarely would such an accompanying battery move with the assault. At Belmont, early in the war, the Chicago Light Battery was thrown in with the initial Federal attacks. And later in 1863 on Grant’s Vicksburg Campaign, there were a few instances where artillery came into action with the initial infantry waves. But these were, I think, less so much U.S. Grant (or.. .gasp.. John C. McClernand) applying Mahan’s accompanying batteries to practice. More so that artillery in a mixed line of march were employed at the onset of a meeting engagement. So why was the accompanying battery disused? Well, to be honest, we might also start questioning the notions about the heavy and light battery employments. 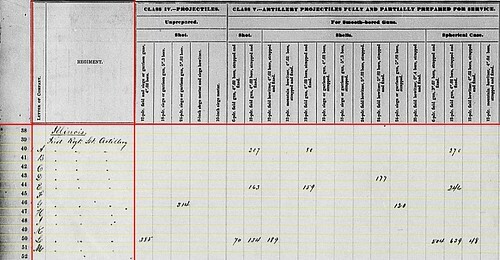 In the first place, by 1861 the US Army was already shedding the designations of heavy and light within the field artillery. The 12-pdr Napoleon was the weapon of choice in what would become, basically, all-purpose batteries. Furthermore, the introduction of better fuses (Bormann, in particular for the smoothbore) gave better accuracy. Not in terms of aiming, mind you. Rather in the ability of the gunner to have the shell or case shot explode at the right time of flight in order to achieve the desired fire effect. With that ability in hand, why press the issue at any range less than 1000 yards? 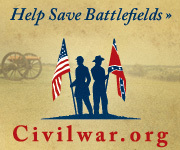 Double down with the rapid adoption of rifled guns at the start of the Civil War. With that said, the question always arises of the impact of the rifled musket with respect to artillery use. I have always contended first and foremost that infantry musketry techniques didn’t change significantly with the adoption of the new technology. Infantrymen were not trained, as a rule, to engage targets out to the effective range of their weapons. Some sharpshooters, maybe. But not the rank and file. Nor were infantry commanders apt to open volley fires out beyond a few hundred yards. So how would that impact the use of artillery? It didn’t. Rather, the reason we see a departure, particularly in regard to the offensive use of artillery, from the Mahanian concepts presented in Outpost was because of the advances in artillery technology. Taking advantage of lighter, longer-ranged, more accurate weapons, practitioners of the artillery (thinking names like Gibbon, Hunt, Barry, and others) began to relook the way their arm could be employed. At the end of 1863, Colonel Thomas S. Mather remained the commander of the 2nd Illinois Light Artillery. Mather had been Chief of Staff for Major-General John McClernand. But with that officer’s relief during the Vicksburg Campaign, Mather had hitched his wagon to a falling star. Mather would go on to serve in other staff positions while remaining the colonel of the regiment. As for the rest of the regiment, batteries served in the Mississippi River Valley in Kentucky, Tennessee, Louisiana, and Mississippi. Battery A: No report. The battery remained with First Division, Thirteenth Corps (minus one detached section). Captain Herman Borris remained in command. Starting the fall at Carrollton, Louisiana, the battery supported some campaigning in October and November through west Louisiana. At the end of December the battery was assigned to the Defenses of New Orleans. At some point in the fall, the first section of the battery, which had served on detached service in Missouri, rejoined the command. Battery B: No report. Captain Fletcher H. Chapman commanded the battery, part of the Sixteenth Corps and assigned to the District of Corinth. The battery would move to Memphis when Corinth was abandoned in January. Battery C: At Fort Donelson, Tennessee with four 3.80-inch James Rifles. Captain James P. Flood’s was assigned to Third Division, Reserve Corps, Army of the Cumberland. But with that corps disbanded with the army’s reorganization, the garrison was part of the District of Nashville, Department of the Cumberland. Battery D: Indicated at Grand Junction, Tennessee with four 3.80-inch James Rifles. Captain Charles S. Cooper remained in command of this battery, then assigned to Fifth Division, Sixteenth Corps, out of the Memphis District. Battery E: No report. In the previous quarter, this battery was at Carrollton, Louisiana with three 6-pdr field guns and one 12-pdr field howitzer. Captain George L. Nipsel, promoted in the late summer, commanded the battery, which was assigned to Third Division, Thirteenth Corps, Department of the Gulf. After supporting campaigns in west Louisiana during the fall, the battery was assigned duty at Plaquemine, Louisiana, District of Baton Rouge. Lieutenant Emil Steger was acting commander at the close of the quarter. Battery F: Indicated at what appears to be Hebron, Mississippi with two 6-pdr field guns and two 12-pdr field howitzers. The battery was assigned to Fourth Division, Seventeenth Corps with Captain John W. Powell in command. But with him serving as division artillery chief, Lieutenant Walter H Powell led the battery. During the fall, the battery participated in an expedition into Louisiana (Harrisonburg). Then returned to Nachez, which is the actual battery location at the close of the year. Hebron, may be a contraction of New Hebron and a place associated with the Meridian Campaign. Thus may allude to the battery location in February 1864, when the report was filed. Battery G: At Columbus, Kentucky with four rifled 6-pdr (3.67-inch) guns. Captain Frederick Sparrestrom commanded this battery. After duty in Vicksburg and Memphis through the summer and early fall, the battery was assigned to District of Columbus, Sixteenth Corps (with duty at times in Union City, Tennessee). 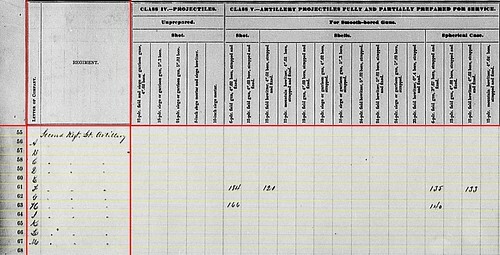 Battery H: Reporting at Clarksville, Tennessee two 6-pdr field guns and four 3.80-inch James Rifles. Captain Henry C. Whittemore remained in command. With the reorganization of the department’s Reserve Corps, the battery was listed in the garrison of Clarksville, District of Nashville, Department of the Cumberland. Battery I: At Chattanooga, Tennessee, turning in an assortment of weapons for six 3-inch Ordnance Rifles. Captain Charles M. Barnett commanded this battery, assigned to Second Division, Fourteenth Corps. Battery K: No report. This battery, under Captain Benjamin F. Rodgers, was at Natchez at this time of the war. A series of reorganizations brought the battery back to Fourth Division, Seventeenth Corps. In the new year, the battery would be assigned to the Defenses and Post of Natchez. Battery L: Listed at Vicksburg with four 3.80-inch James Rifles. Part of Third Division, Seventeenth Corps. Captain William H. Bolton commanded. Battery M: No report. In the previous quarter, the battery reported four 3.80-inch James Rifles and a location of Greenville, Tennessee. Captain John C. Phillips command this battery, which assigned to the Twenty-third Corps, Army of the Ohio. Confederate advances in east Tennessee, in October, forced the withdrawal of Federal forces east of Knoxville, and that included Battery M. And around that time, Phillips was recalled to Nashville on other duties, leaving Lieutenant W.C.G.L. Stevenson in command. The battery was sent out in support of two regiments of cavalry scouting for Confederate raiders. This force was camped four miles outside Rogersville, Tennessee on November 6 when attacked by Confederates under Brigadier-General William E. Jones. Ill-prepared, outnumbered, and outmaneuvered, the force was all but destroyed. The battery spiked their guns. Survivors who were not captured reassembled under Phillips and assigned duty at Camp Nelson, Kentucky. Such events explain the lack of reporting for this battery. Battery F: 184 shot and 135 case for 6-pdr field guns; 120 shell and 133 case for 12-pdr field howitzers. Battery H: 166 shot and 140 case for 6-pdr field guns. Battery F: 28 canister for 6-pdr field guns and 31 canister for 12-pdr field howitzers. Battery H: 42 canister for 6-pdr field guns. Battery C: 100 shot and 68 shell (time fuse) for 3.80-inch James rifles. Battery G: 566 shell (time fuse) for 3.67-inch rifles. Battery H: 10 shot for 3.80-inch James rifles. Battery I: 222 shell (time fuse) for 3-inch rifles. Battery L: 123 shell (time fuse) for 3.80-inch James rifles. Battery C: 385 shell (percussion fuse) and 346 canister for 3.80-inch James. Battery G: 80 canister for 3.67-inch rifles. Battery H: 32 canister for 3.80-inch rifles. Battery I: 125 shell (percussion fuse) and 286 canister for 3-inch rifles. Battery L: 161 shell (percussion fuse) and 60 canister for 3.80-inch rifles. Battery C: 7 shot, 24 shell, and 2 canister for 3.80-inch rifles. Battery D: 45 shot, 203 (?) shell, and 60 canister for 3.80-inch rifles. Battery H: 105 shot, 242 shell, and 214 canister for 3.80-inch rifles. Battery L: 128 shell and 129 canister for 3.80-inch rifles. Battery D: 64 shot and 128 shell for 3.80-inch rifles. Battery I: 252 shot for 3-inch rifles. Battery D: 64 case shot for 3.80-inch rifles. Battery C: Seventy-four Colt army revolvers, four cavalry sabers, and six horse artillery sabers. Battery F: Twenty-three Colt army revolvers and twenty-three cavalry sabers. Battery H: Fifty-four Colt army revolvers and seven cavalry sabers. Battery I: Thirteen Colt navy revolvers and fifteen horse artillery sabers. Battery C: 728 6-pdr or 12-pdr bags. Battery D: 540 James rifle bags. Battery G: 746 6-pdr or 12-pdr bags. Battery C: 1,880 army revolver cartridges; 1,150 friction primers; and 503 percussion caps. Battery F: 1,010 army revolver cartridges and 365 friction primers. Battery G: 566 paper fuses and 895 friction primers. Battery H: 1,000 army revolver cartridges; 1,200 friction primers; 50 yards of slow match; and 500 percussion caps. Battery I: 460 paper fuses and 1,694 friction primers. Battery L: 800 friction primers. At the close of 1863 the 2nd Illinois was sort of at an organizational cross-roads. Batteries from this regiment had participated in several of the important western campaigns of the year, in some cases playing an important role. Some would continue at the fore of the 1864 campaigns. But many of these batteries were sent to garrison duties. Some, such as Battery M, would never serve as a battery again. By the end of the year, enlistments would come due. Instead of recruiting up to full strength, the state consolidated many of these batteries. So this “snapshot” by way of the ordnance summary is in some ways a last good look at the unit as a full organization.